A cheap hybrid vehicle for the road - and you don't need a driver's license! Hybrid cars are increasing in popularity. You know, they’re the ones that combine battery electric power with a petrol engine. With their on-demand high torque electric motors and effective regenerative braking, hybrid cars are fun to drive and incredibly economical. But for even the cheapest new hybrid you’ll need to hand over about AUD$30,000. So maybe a hybrid car is out of the question, but what about a hybrid bike? 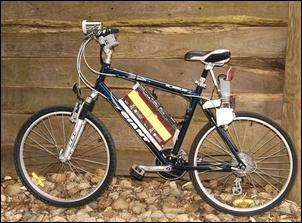 Yes, with a bit of ingenuity, you can add battery electric assist to a bicycle. It won’t rocket you up hills at an incredible pace but it will provide substantial help for your tired legs. On flat roads, well, you can stop pedalling. And when you head downhill, forget the caliper brakes – instead, regenerative braking will slow you down and at the same time, put charge back into the battery. That’s power that you can then access at the next hill! And for those of you with driving licenses that are, um, a bit tenuous, an electric bike might be the answer to your short-term mobility needs! 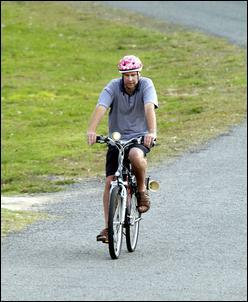 The bike that you see here was electrified for initially under AUD$120. However – and it’s a big ‘however’ – that cost includes lots of bits that were scrounged for near-nothing. So this series doesn’t cover in step-by-step detail how to add electric power to a bike using components that you can buy at the local shop. Instead, it shows how it was done using the parts that I could lay my hands on at the time. The bike you see here is actually the third electric bike I have built over the years. So I speak from experience when I say it’s easy to overcomplicate things, make the system too heavy, and not provide enough power. To put things another way: an electric bike needs to use a mechanism that’s light, simple and powerful. It sounds obvious, but it’s not! The simplest, most readily available powerful low voltage electric motor is a 12V brush-type permanent magnet motor. That’s the type used in car windscreen wipers, starter motors, electric hydraulic brake boosters and electric power steering. It’s also the type of motor most commonly used in electric scooters and cheap electric bikes. This breed of motor has several characteristics that make it useful in this application. It’s common, low cost, can act as a motor or a generator, and its power increases rapidly with increasing input voltage. So in this design we use a 12V perm mag brushed motor. The next step is to drive the bicycle forwards with the motor. Two requirements need to be met: (1), because the electric motor spins a lot faster than we want the bike wheels turning, we need to gear it down, and (2), we have to find a way of connecting the output shaft of the motor to the wheel. Both problems can be solved in the one step by using the motor to drive a small diameter roller which is brought to bear on the tread of the tyre. Again, it’s simple, cheap and effective. Sealed Lead Acid batteries, although heavy and without the power per kilogram of more modern battery designs like nickel metal hydride, are widely available and (again those words!) simple, cheap and effective. They’re the ones we used. When electrifying a bike, it is best if you use a bicycle with a heavy duty frame and wheels. While the total mass of the electrics and a normal rider is less than would occur with an overweight person riding the bike, a strong bike (eg a mountain bike) gives a safety margin and should ensure adequate durability. So, how do we wire the motor to the batteries? Here’s where it starts getting interesting. There are two points to realise. Firstly, a motor of the sort that we’ve been describing is basically a constant speed design. That is, when fed a specific voltage, it wants to rotate at the one speed. Of course, as it is loaded down, it will rotate more slowly – but importantly, it will then also draw more current as it attempts to get back to its ‘natural’ speed. Secondly, in any practical electric-assist bike, the natural speed of the bike (say, on the flat) will be way less than the speed limit – any speed limit! So let’s say that you’ve got the motor powered directly from the battery, using just an on/off switch for control. The outcome of the available power, the gearing and aerodynamic and frictional drags is that when the motor is on, the bike travels at (say) 20 km/h. No one in their right mind would want to go slower (and if you need to, just turn off the motor and pedal! ), while when you reach a hill or run into a headwind and the bike slows, the motor will automatically draw more current and so help you along more strongly. In effect, the motor self-regulates its current draw – taking more as more is needed, and reducing its consumption as less power is required. Hey, that’s fine – and all just done with an on/off switch! But what about regenerative braking? Lots of electric assist bikes don’t use any form of regenerative braking, so in hilly areas they’re wasting plenty of power in heating the brakes - power which could otherwise be going back into the battery. So how do we make regen braking happen? Regen braking occurs when the bike’s speed exceeds the ‘natural’ speed of the motor. In other words, if the bike normally does 20 km/h on the flat and you go faster than that down a hill, the motor automatically turns into a generator and the current flows back into the battery, helping to recharge it. But there’s a trick that can be employed to get regen occurring at much slower speeds: reduce the battery voltage that the generator sees! This diagram shows how it is done. Two batteries are used with a double pole, double throw (DPDT) switch wired to configure the batteries in either series or parallel. (A further switch acts as an on/off control.) Let’s assume that they’re 12V batteries. When the batteries are configured in series, 24V is available at the motor. 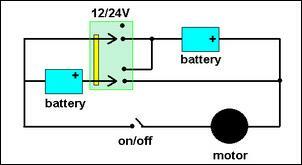 When the batteries are switched to parallel, 12V is available at the motor. The natural speed of the bike in 24V mode might be 20 km/h, but in 12V mode it’s more likely to be just a quick walking pace. So when you switch to 12V mode when rolling down a hill, the motor tries to pull you back to that slow speed. As a result, regen braking is very effective – in fact, in this example, the regen will work at all speeds down to a walking pace... at which point the 12V batteries then start driving the bike forward. The control system is easy to use. One switch is a master on/off control. The other provides either 12V or 24V to the motor. 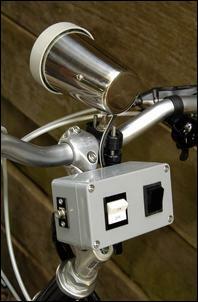 12V mode is used to slow the bike down, pushing power back into the batteries. It’s ideal when descending hills. 24V mode provides maximum power and is used all the time that regen braking isn’t wanted. So running just two simple (but heavy duty) switches gives you excellent control over the bike, both in power and braking modes. Finally in this system overview, the roller that’s driven by the motor needs to be pressed against the tyre. This is achieved by an aluminium support frame that holds the motor. The cradle is hinged at its forward edge to the bike frame and a heavy duty spring is used to force the trailing edge of the frame downwards, so pushing the motor roller against the tyre. That way the roller drives the tyre, just like a tyre drives a roller on a chassis dyno.